Separation of ytrrium and dysprosium from the prepared chloride liquor of REEs concentrate (44.1% Y, 9.04% Dy, 5.15% Er, 4.56% Gd, 2.31% Yb, 1.33%Ho and 1.23% Sm) has been studied. The concentrate was obtained by the sulfatizing roasting of the xenotime bearing ferruginous sandstone (from southwestern Sinai) followed by precipitation as oxalates and dissolution in HCl. Treatment of the prepared REEs chloride with Na2CO3 was achieved under optimum conditions. By addition of H2O2 to carbonate solution, Dy, Gd, Sm and Yb are precipitated while Y and Er left behind in the filtrate. Extraction of 87.3% Dy from the produced precipitate was studied using Cyanex 272. The relevant conditions for the extraction and stripping processes have been optimized. After acidified, Y in the filtrate and Dy in the stripping solution are precipitated as oxalates. Pure products of Y2O3 and Dy2O3 have been prepared and subjected to different analyses. Much attention has been paid to the uses of rare earth elements (REEs) especially Dy and Y in the manufacture of many functional materials. Dy plays an important role in the manufacturing of laser materials, nuclear reactors, hybrid cars, color television tubes and commercial lighting with vanadium and other elements. Dysprosium’s main use is in alloys for neodymium-based magnets. This is because it is resistant to demagnetization at high temperatures [1-5]. Yttrium is used in the manufacturing of ceramics, in fluorescent lighting phosphors, computer displays and automotive fuel consumption sensors because Y has the highest thermodynamic affinity for oxygen of any element. Yttria-stabilized zirconium oxide is used in high temperature applications, such as in thermal plasma sprays. Crystals of the yttrium–iron–garnet (YIG) variety are essential to microwave communication equipment [6-9]. Vijayalakshmi described a process for the recovery of rare earths from xenotime concentrate by digestion with sulfuric acid. A low-grade xenotime concentrates (27% Y2O3 and 15.6% heavy rare earth) and a high-grade xenotime (41.8% Y2O3 and 20.55% heavy rare earths) are produced in India. Both types of materials have been tested and 98% solubilization of metal values has been achieved. The heavy rare earths have been enriched in the filtrate. Other impurities such as iron, uranium, sulfate and phosphate have been effectively removed by precipitation of rare earths with oxalic acid. The recovery of 99% of HREEs along with Y was achieved . Separation of individual lanthanides from each other is very difficult due to their chemical similarity. Yttrium and dysprosium is separated via solvent extraction technique from different acid media using different solvents such as Cyanex 923, bis (2, 4, 4-trimethylpentyl) dithiophosphinic acid, sec-octylphenoxy acetic acid (CA12) synergtic with Bis (2, 4-4-trimethylpentyl) phosphinic acid (Cyanex 272) and trialkyl phosphine oxide [11-15]. Mohammadi et al. studied the separation of Dy, Nd and Y by solvent extraction using D2EHPA and EHEHPA. The results showed that a mixture of D2EHPA and EHEHPA provide a better separation of Y (III) from Dy (III) . Vasconcellos et al. studied the solubility of REEs in Na2CO3. The used concentrate contains (%) 2.4 Y2O3, 0.6 Dy2O3, 2.7 Gd2O3, 2.5 CeO2, 33.2 Nd2O3, 40.3 La2O3, 4.1 Sm2O3 and 7.5 Pr6O11. The ability of carbonate for the dissolution of REEs and an easy separation of yttrium was achieved. The experiments indicated that a single leaching operation was sufficient to get a rich yttrium solution with about 60.3% Y2O3. In a second step, this yttrium solution was treated with an excess of hydrogen peroxide, the other REEs peroxides being completely precipitated and separated from yttrium. Yttrium was recovered from the carbonate solution as the oxalate and finally as oxide. The final product is an 81% Y2O3 [16,17]. The present work is oriented to study the recovery of Y and Dy from rare earths concentrate prepared by chemical processing of xenotime bearing ferruginous sandstone, Southwestern Sinai. Treatment and precipitation of the REEs chloride (prepared from the concentrate) with Na2CO3 and H2O2 respectively were investigated. Y was left behind in the filtrate while the other REEs were precipitated. Separation of Dy has been studied via solvent extraction technique using Cyanex 272 modified in kerosene. Y and Dy were precipitated by addition of oxalic acid from their corresponding solutions after being acidified with HCl. The working rare earths (REEs) concentrate has been prepared from the xenotime bearing ferruginous sandstone of Wadi El Sahu, Southwestern Sinai. The latter is chemically processed with concentrated H2SO4 (in 1/1.5 S/L ratio at 250°C for 2 h) where about >90% of the REEs are solubilized. The REEs sulfate was precipitated as oxalates and calcined at 850°C . A known weight of the obtained rare earths oxides is dissolved by a calculated volume of HCl in the beaker with continuous heating followed by addition of de-ionized water to obtain on the rare earths chloride solution. Bis (2, 4-4-trimethylpentyl) phosphinic acid (Cyanex 272) was provided by Loba Chemie Pvt. Ltd., as well as kerosene, methanol, HCl and Na2CO3 were provided by El-Nasr Chemicals Company, Egypt. Several experiments were performed by the reaction of a known volume of rare earths chloride solution with the same one of Na2CO3 solution at room temperature under different conditions. The precipitation of heavy rare earths (except Y) from carbonate solution was carried out by the addition of different volumes of H2O2. Yttrium was left behind in the filtrate (which can be precipitated with oxalic acid), while the peroxy precipitate was acidified with HCl and reacted with Cyanex 272 in kerosene under optimum conditions. The stripping of Dy from Cyanex 272 has been carried out using carbonate solution under desired conditions. The recovered dysprosium is precipitated with oxalic acid. The rare earths contents in the solid concentrate are analyzed using scanning electron microscopy SEM, JSM-84OA, JEOL, Tokyo, Japan, with the possibility of enlargement by 180.000 times and the resolution of 10 nm and represented in Figure 1. For analysis of individual heavy rare earths elements, ICP-MS spectrometry model Philips PV 8490, China was used . The capability of (ICP-MS) for simultaneous multi-element determination makes it very attractive for the analysis of geological and chemical materials. Morphologically, the solid REEs concentrate is yellowish white color and relatively soft grains . Chemically, the obtained concentrate mainly contains % of 44.08 Y, 9.04 Dy, 5.15 Er, 4.56 Gd, 2.31 Yb, 1.33 Ho and 1.23 Sm, with minor amounts of some impurities. Figure 1: SEM analysis of REEs in the xenotime concentrate. Where, Co is the concentration of the initial sample and Cf is the concentration of treated one. The experimental efficiency (E) was expressed as enrichment percent (%) of studied materials. The sample of 40 g working rare earth concentrate (produced via the chemical processing of xenotime bearing ferruginous sandstone as mentioned above) is dissolved in 50 ml concentrated HCl with continuous heating until evaporated to half volume. REEs are completely dissolved followed by addition of distilled water to attain up to volume 1000 ml. The analysis of the chloride liquor was reported in Table 1. The analysis indicate that the concentrations of rare earths have attained value of 19.8 g/l, 4.78 g/l, 2.74 g/l, 2.05 g/l, 1.24 g/l, 0.14 g/l and 0.08 g/l for Y, Dy, Er, Gd, Yb, Ho and Sm respectively. Table 1. Analysis of the REEs chloride liquor. The carbonate chemistry is very important for precipitation of the rare earths . Rare earths carbonates system is of utmost importance from both the analytical and industrial aspects and the leaching efficiency of rare earth elements depends on many factors such as reaction time and Na2CO3 concentration. A series of experiments was performed at room temperature by the reaction of 10 ml prepared RECl3 sample with the same volume of 1% Na2CO3 (10 ml) under different periods of time ranging from 10 min-30 min. The results of the solubility efficiency for individual rare earth elements have been plotted in Figure 2. 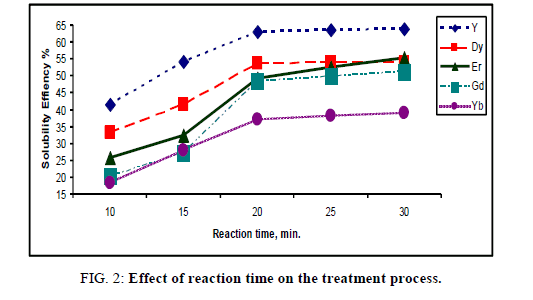 Figure 2: Effect of reaction time on the treatment process. The results show that, at 20 min the solubility efficiency has been increased and reached the values of 63.1%, 53.7%, 49.2%, 48.4% and 37.2% for Y, Dy, Er, Gd and Yb respectively, with trace concentration of Sm and Ho. Further, increase in the time at 20 min has not improved the solubility efficiency of individual rare earth elements. At room temperature, different concentrations of Na2CO3 ranging from 1%-7% have been studied during 20 min using the same volume of the prepared HREEs sample and Na2CO3. The results of the solubility efficiency of individual rare earth elements versus Na2CO3 concentrations have been plotted in Figure 3. Figure 3: Effect of carbonate concentration on the dissolution process. The data in the Figure 3 indicate that, under the applied experimental conditions, the dissolution of individual rare earth elements in (5%) Na2CO3 has increased to become 88.3, 84.2, 64.6, 57.3 and 46.2 for Y, Dy, Er, Gd and Yb respectively. After 5% of Na2CO3, the solubility of yttrium and dysprosium has slightly increased. This indicates that the rare earths solution has saturated with carbonate [17-19]. Therefore, it can be concluded that 5% Na2CO3 would be considered as an optimum concentration for reach the maximum dissolution of individual rare earth elements in the carbonate system. At room temperature a series of precipitation experiments were performed by adding different volumes of hydrogen peroxide (H2O2) ranged from 20 ml-100 ml to (50 ml) rare earths carbonate solution (containing 17.45 g/l Y, 4.02 g/l Dy, 1.77 g/l Er, 1.17 g/l Gd and 0.57 g/l Yb). The resulted data is shown in Table 2. Table 2. Effect of H2O2 addition on the precipitation of REEs. From the data, it is clear that the precipitation efficiency of Dy, Gd and Yb elements is increased with increasing the added volume of H2O2 to reach 97.3%, 83.2% and 67.1% respectively at 30 ml H2O2. On the other hand, Y is not absolute precipitation while Er was suspended and completely precipitated after settling for 24 h. The produced peroxycarbonate HREE precipitate contains 96.8% Dy, 73.0% Gd and 57.0% Yb. Yttrium was recovered from the filtrate after being washed with 20 ml H2O2 (to precipitate the residue of REEs) and acidified with HCl at pH 2 followed by addition of oxalic acid. The light-yellow precipitate oxalate was dried and fired to oxide . 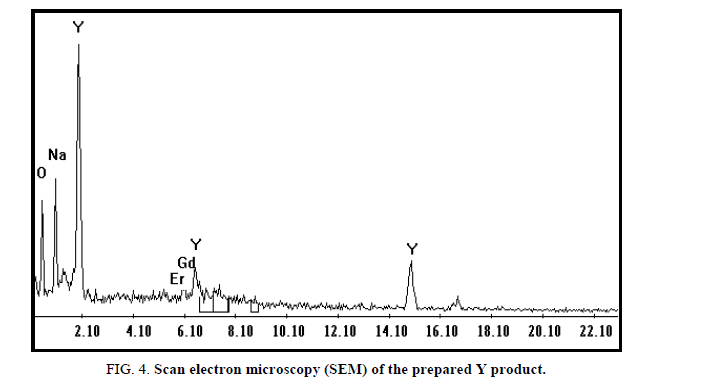 The SEM analysis of obtained oxides contains 91.6% Y2O3 and 2.7% Er2O3 Figure 4. Figure 4: Scan electron microscopy (SEM) of the prepared Y product. Effect of shaking time: It is well known that the shaking time is one of the predominant factors governing extractability. The extraction of rare earths was conducted at different periods of time ranging from 5 min to 25 min. The other fixed operating conditions were 1/1 organic/aqueous (phase ratio) using 0.1 M cyanex concentration at room temperature. The effect of shaking time on extraction of heavy rare earths is represented in Figure 5. 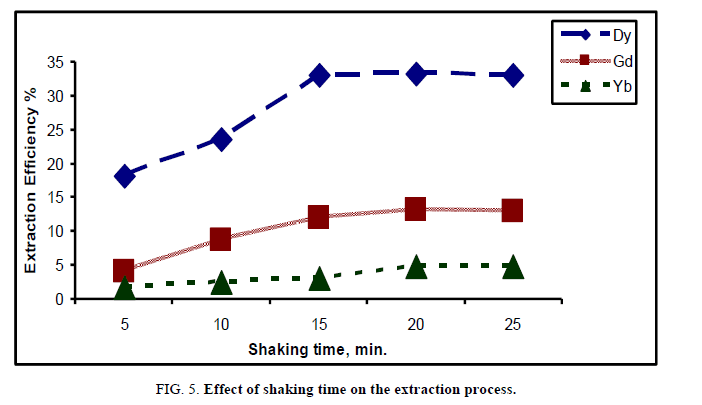 Figure 5: Effect of shaking time on the extraction process. From the obtained results, the extraction efficiency of Dy, Gd and Yb elements increased as the shaking time increased to reach 33.1%, 11.9% and 3.08% respectively up to 15 min. However, when the contact time exceeded 15 min, the extraction efficiency was constant. The low values of extraction efficiency in 5 min were due to the fact that the feed passed immediately into the solvent without separation. As the contact time increased, the solvent phase became rich in the feed and therefore, the extraction efficiency of heavy rare earth elements increased. The results for the effect of shaking time were in agreement with Buchalova et al. as well as Jorjani and Shahbazi . The period of 15 min is the optimum time which given the highest values for extraction process of Dy. Effect of phase modifier: During the contact of solvent (cyanex 272) with HREEs chloride solution (free from Y), a "third phase" of an insoluble viscous solution was formed. Several experimental conditions such as aqueous acidity, extracted metal, diluents and extractant structure can affect the formed third phase. This phenomenon is more important for extraction systems containing extractants of amine type and solvents with low polarity and leads to the increase of separation duration simultaneously with the diminution of its efficiency. The formation of the third phase can be avoided by addition of a “phase modifier” in the organic solvent [21,22]. Generally, this compound should be an alcohol with an aliphatic chain carbon atom and modifies the polarity of the solvent, promoting the breakage of the stable emulsion and solubilization of its content. Adding a modifier to the organic phase is the most common method of preventing third phase formation. Methanol has been tested under different concentrations (0.05 M-0.5 M) to show the variation in extraction efficiency values under the same previous conditions of 1:1 phase ratio (organic/aqueous) using cyanex concentration of 0.1 M in kerosene and shaking for 15 min. The results are illustrated in Figure 6. Figure 6: Effect of addition of modifier on the extraction process. From Figure 6, the concentration of 0.3 M methanol gives the highest values of extraction efficiency for Dy which corresponds to 68.3% and then an appreciable increase was occurred after this value for Gd and Yb equals 28.9% and 22.3% respectively. The addition of methanol induced the increase of the extraction efficiency because if its ability to soluble in the two phases and the most important influence being recorded for the solvent with lower polarity. Moreover, the volumetric fraction of alcohol controls the number of extractant molecules participating in the interfacial product formation [23,24]. Effect of solvent concentration: The effect of the solvent concentration on rare earth extraction was studied by varying the cyanex 272 concentrations in kerosene from 0.1 M to 1.0 M modified by 0.4 M 1-octanol and dissolved in kerosene. The extraction experiments were carried out using equal (organic/aqueous), a contact time of 15 min and a shaking speed of 150 rpm. The effect of the cyanex concentration on the extraction efficiency is shown in Figure 7. 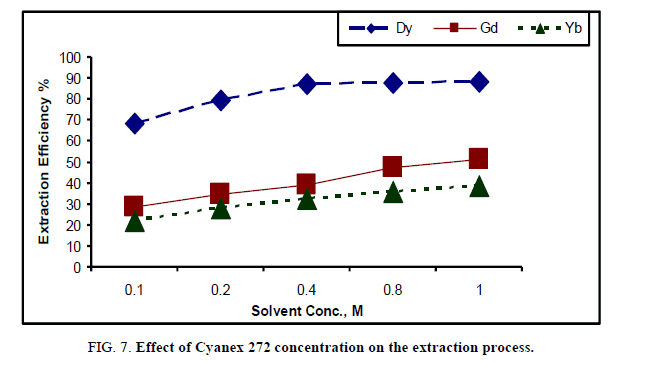 Figure 7: Effect of Cyanex 272 concentration on the extraction process. From the results, it is noted that the extraction efficiency for Dy increased with the cyanex 272 concentration from 0.1 M to 0.4 M which reach to 87.3% at 0.3 M cyanex 272. However, a slight increase in the extraction efficiency of Dy was observed when the concentration of cyanex 272 was increased at 0.4 M. The extraction of Gd and Yb increased gradually after value of 0.4 M cyanex 272 to reach 51.2% and 38.4% respectively. So, the cyanex 272 concentration of 0.4 M was selected the optimum concentration for Dy extraction. The plotted data showed that, the extractant concentration plays a significant factor in the extraction process. Cyanex 272 was chosen as the extractant of heavy rare earths due to both its excellent chemical stability and its physical properties. However, it is limited by its high viscosity and density. A diluent such as kerosene reduces the viscosity and density of the organic phase to improve the phase separation characteristics. All of the rare earths typically exhibit in a trivalent oxidation state, while some of them can also occur in the divalent (Sm, Eu and Yb) states. These states are always less stable than the trivalent state. In the divalent state, the elements exhibit markedly different chemical behavior compared with that in the trivalent state (Gupta and Krishnamurthy) . Effect of organic/aqueous ratio: At room temperature, the volumes of cyanex 272 solution (0.4 M) modified in kerosene ranged from 50 ml-400 ml (which corresponding to 0.5:1 up to 4:1 organic/aqueous phase ratio) were contact with 100 ml from each rare earth sample during 15 min. The values of extraction efficiency % of rare earths elements were shown in Figure 8. 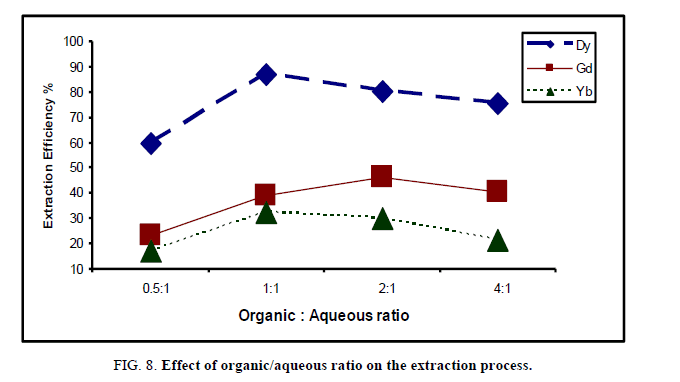 Figure 8: Effect of organic/aqueous ratio on the extraction process. The data show that there is a general increase in the extraction efficiency of rare earths till equal 1, which corresponding to 87.3%, 39.1% and 32.5% for Dy, Gd and Yb respectively. After this ratio (for Dy) the effect of organic/aqueous ratio on the extraction process was reversible, i.e. by increasing organic/aqueous ratio, the extraction efficiency decreases gradually. This behavior indicates that the extraction efficiency was affected by the viscosity of the solvent as the low viscosity leads to low pressure drop and good mass transfer [21,22]. The extraction operation of heavy rare earths by 0.4 M cyanex 272, modified by 0.3 M methanol, in kerosene was carried out three times using equal (organic/aqueous) phase ratio, at room temperature for 15 min. The results are graphically represented in Figure 9. 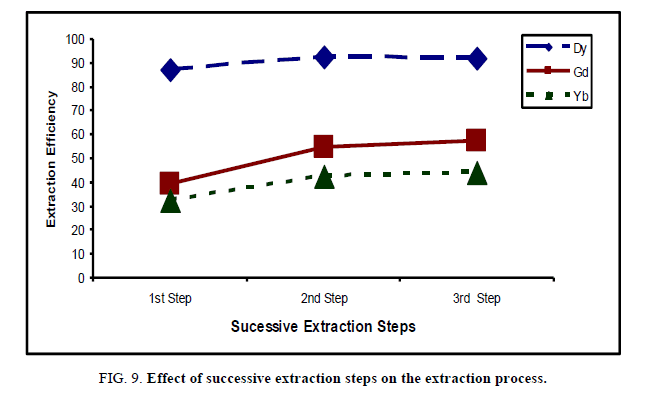 Figure 9: Effect of successive extraction steps on the extraction process. The results indicate that, the extraction efficiency % of Dy, Gd and Yb increases after the second successive step which becomes 92.7%, 54.7% and 42.5%, while in the third leaching process, the extraction efficiency was increased very slightly due to the effect of distribution coefficient . It is more efficient to perform two extractions with 1/2 volume of extracting solvent than 1 large volume. Stripping investigations: The stripping investigations were carried out using diluted HCl to determine the optimum conditions for successfully recovering of dysprosium from the organic solution. The effect of experimental time, HCl concentration and aqueous/organic phase ratio was studied. 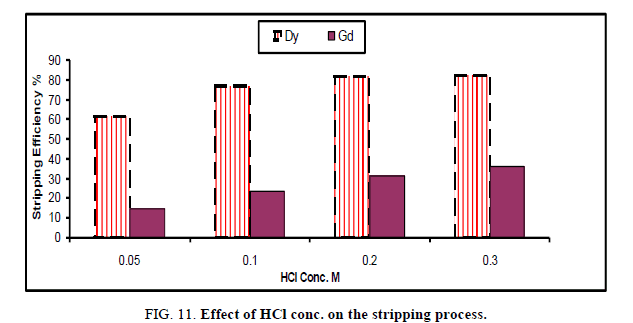 Effect of stripping time: The effect of stripping time on the recovery of Dy, Gd and Yb from cyanex solution was investigated using 0.05 M HCl Figure 10. The process was performed using equal phase ratio (1st step) at room temperature, while the contact time was ranged from 5 min to 20 min. Figure 10: Effect of time on the stripping process. The results in Figure 10 indicate that, the stripping efficiency % slightly increases from 5 min to 15 min. and then remains constant till 20 min. This indicates that the process is rapid, i.e. is not a diffusion controlled process. At 10 min the stripping percent of Dy and Gd equals 61.4 and 19.3 respectively, while the value % of Yb was not detected. Effect of HCl concentration: For the best stripping of dysprosium uploaded on cyanex 272, the concentration of HCl was varied from 0.05 M to 0.3 M and the process were carried out under room temperature in time equal 15 min. The results were diagrammatically shown in Figure 11. Figure 11: Effect of HCl conc. on the stripping process. The results indicate that, by increasing the conc. of HCl from 0.05 → 0.2 M, the stripping efficiency become 81.4% and 31.8% for Dy and Gd respectively. After this concentration, the value of stripping efficiency increases very slightly due to decrease the capacity of carbonate solution as well as the viscosity of organic phase which lead to increase the reversible effect of solvent as well as decrease the mass transfer . Effect of phase ratio: Different phase ratios of HCl and cyanex 272 (bearing Dy, Gd and Yb) were studied ranging from 0.5 → 3 at room temperature during 15 min to show the maximum efficiency of for stripping of HREEs from the organic phase. The data was illustrated in Figure 12. 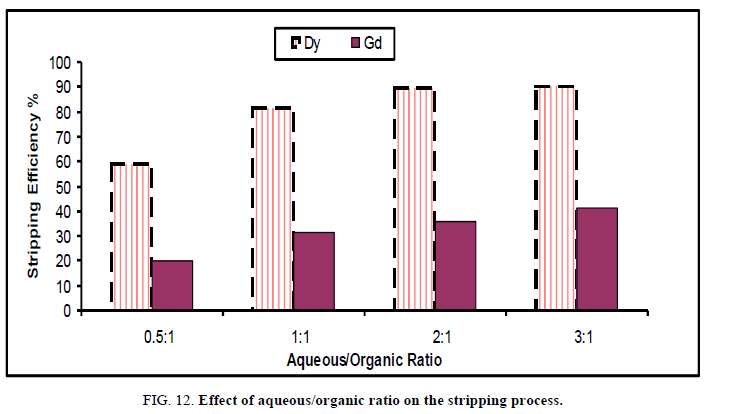 Figure 12: Effect of aqueous/organic ratio on the stripping process. By increasing aqueous/organic ratio, the stripping efficiency was increased and reached the maximum value at 2:1 which corresponding to stripping 89.6% and 36.3% of Dy and Gd Figure 12 respectively. Further increase in organic/aqueous ratio was associated with a very slight increase in stripping percent. Accordingly, 2:1 aqueous/organic phase ratio is recommended for stripping when using HCl solution. For the stripping of dysprosium from cyanex 272 modified in kerosene, the process should be performed using 2:1 phase ratio of 0.2 M HCl at room temperature for 15 min contact time. In the bench-scale work, the mixed lanthanides Dy and Gd were precipitated from the strip liquors by the addition of excess of oxalic acid with stirring for 1 h. The precipitated oxalate was filtered, washed with distilled water and calcined in a muffle furnace at 850°C for 2 h to obtain a dysprosium oxide (Dy2O3) . The rare earth oxide (ΣREO) product, analyzed by ICP-MS apparatus, contains 88.2% and 9.7% of Dy2O3 and Gd2O3 respectively. The scan electron microscopy (SEM) for the REO was shown in Figure 13. The mixed rare earth oxide was in the form of light brownish powder. Analysis of the rare earth oxides in about 0.25 g of the product gave ΣREO content of 97.9%. 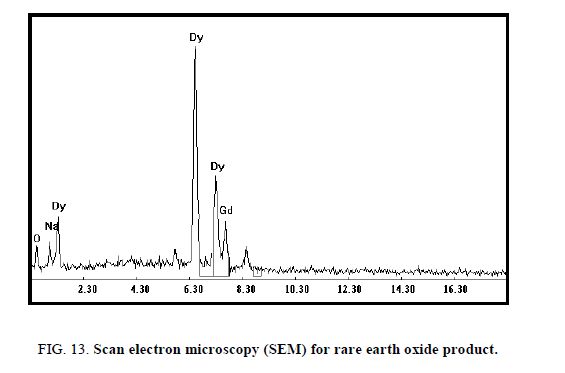 Figure 13: Scan electron microscopy (SEM) for rare earth oxide product. • For the dissolution of rare earths concentrate, HCl was used and the treatment was carried out by Na2CO3. The optimum conditions, at which the process was performed, are contact time of 20 min. using 5% of carbonate solution. The solubility efficiency reached the highest values of 88.3, 84.2, 64.6, 57.3 and 46.2 for Y, Dy, Er, Gd and Yb respectively, while Ho not soluble as well as detected in the analysis. By the addition of (80 ml) H2O2, the heavy rare earths (Dy, Gd and Yb) was precipitated while Y and Er left behind in the filtrate which undergone precipitation by oxalic acid after being acidified and fired to oxide. • Extraction of Dy from the obtained peroxy precipitate (after dissolution with HCl) was performed us ing cyanex 272 (modified by methanol) in kerosene. The efficiency for extraction process was 87.3%, 39.1% and 32.5% for Dy, Gd and Yb respectively under 15 min. in equal phase ratio of 0.4 M cyanex 272 in 0.3 M methanol as modifier. The efficiency of Cyanex 272 for extraction of Dy was increased after the separation of Y. • The extraction efficiency for Dy, Gd and Yb was reached 92.7%, 54.7% and 42.5% respectively after 2nd extraction step. The stripping of 89.6% and 36.3% of Dy and Gd respectively was obtained using 0.2 M HCl (2:1 aqueous/organic phase ratio) at 15 min. Dy is precipitated from the latter solution using oxalic acid. • Pure oxides of Y and Dy are obtained after calcination at 850°C for 2 h. The latter oxides are subjected to ICP-MS and SEM analysis. The amount contains 0.25 g of the product gave a ΣREO content of 97.9%. A technological flow sheet Figure 14 for the recovery of yttrium and dysprosium from the xenotime bearing ferruginous sandstone of southwestern Sinai has been formulated. Figure 14: Flow sheet for extraction of Y and Dy from the xenotime bearing ferruginous sandstone of southwestern Sinai. The authors wish to thank the Egyptian Atomic Energy Authority for helping in the analysis of individual REEs by ICP-MS technique. The authors also thank the collaboration from the Egyptian Nuclear Materials Authority. Xu F, Zhang L, Dong X, et al. Effect of DyF 3 additions on the coercivity and grain boundary structure in sintered Nd–Fe–B magnets. Scripta Materialia. 2011;64(12):1137-40. Seo Y, Morimoto S. Comparison of dysprosium security strategies in Japan for 2010–2030. In: Resources Policy. 2014;39:15-20. Zepf V. Rare earth elements: A new approach to the nexus of supply, demand and use: Exemplified along the use of neodymium in permanent magnets. Springer Science and Business Media. 2013. Riaño S, Binnemans K. Extraction and separation of neodymium and dysprosium from used NdFeB magnets: An application of ionic liquids in solvent extraction towards the recycling of magnets. Green Chem. 2015;17(5):2931-42. Juan LI, Zhang C, Qiang T, et al. Photoluminescence and thermoluminescence properties of dysprosium doped zinc metaborate phosphors. J Rare Earths. 2008;26(2):203-6. Xie F, Zhang TA, Dreisinger D, et al. 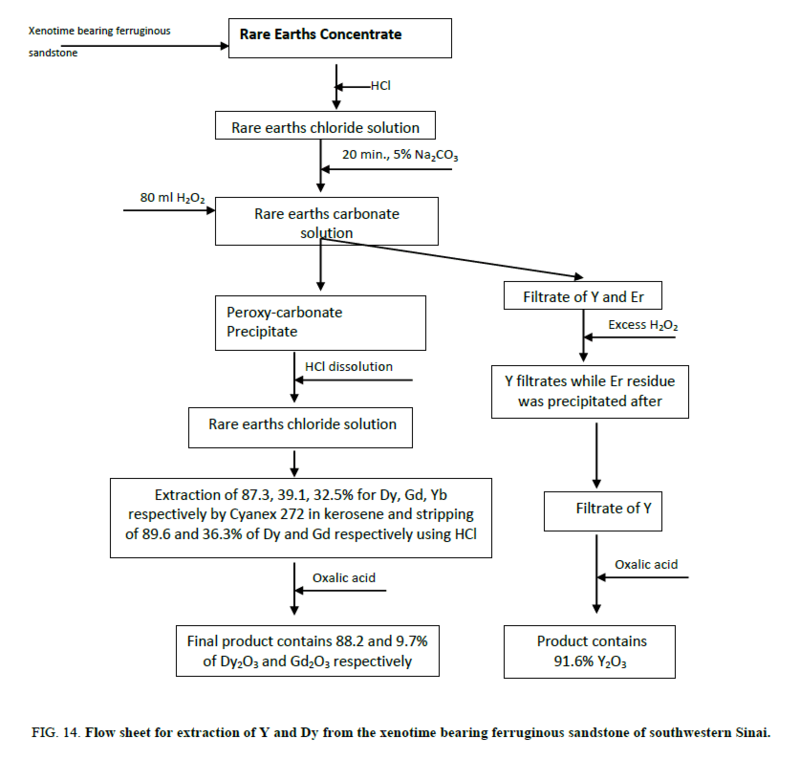 A critical review on solvent extraction of rare earths from aqueous solutions. Miner Eng. 2014;56:10-28. Song HF, Hong M. The analysis and prediction of rare earth industry in China (II). Rare Earth, Information. 2010; (2):8-12. Krishnamurthy N, Gupta CK. Extractive metallurgy of rare earths. CRC press, Bhabha Atomic Research Centre, Mumbai, India. 2004. Vijayalakshmi R, Mishra SL, Singh H, et al. Processing of xenotime concentrate by sulphuric acid digestion and selective thorium precipitation for separation of rare earths. Hydrometallurgy. 2001;61(2):75-80. Gupta B, Malik P, Deep A. Solvent extraction and separation of tervalent lanthanides and yttrium using Cyanex 923. Solvent Extr. Ion Exch. 2003;21(2):239-58. Reddy ML, Luxmi Varma R, Ramamohan TR, et al. Cyanex 923 as an extractant for trivalent lanthanides and yttrium. Solvent Extr Ion Exch. 1998;16(3):795-812. Yoon HS, Kim CJ, Chung KW, et al. Recovery process development for the rare earths from permanent magnet scraps leach liquors. J Braz Chem Soc. 2015(6):1143-51. Wang Y, Liao W, Li D. A solvent extraction process with mixture of CA12 and Cyanex272 for the preparation of high purity yttrium oxide from rare earth ores. Sep Purif Technol. 2011;82:197-201. Jorjani E, Shahbazi M. The production of rare earth elements group via tributyl phosphate extraction and precipitation stripping using oxalic acid. Arabian J Chem. 2016;9:S1532-9. Mohammadi M, Forsberg K, Kloo L, et al. Separation of Nd (III), Dy (III) and Y (III) by solvent extraction using D2EHPA and EHEHPA. Hydrometallurgy. 2015;156:215-24. Vasconcellos ME, Rocha SM, Pedreira WR, et al. Enrichment of yttrium from rare earth concentrate by ammonium carbonate leaching and peroxide precipitation. J Alloys and Compounds. 2006;418(1):200-3. Hassan SM. Studies on Extraction of Uranium from Sandstone Adediya Formation, Wadi El Sahu, Southwestern Sinai, Egypt. Ph.D. Thesis, Faculty of Science, Zagazig University, Zagazig, Egypt. 2013. Wang ZH, Yan XP, Wang ZP, et al. Flow injection on-line solid phase extraction coupled with inductively coupled plasma mass spectrometry for determination of (ultra) trace rare earth elements in environmental materials using maleic acid grafted polytetrafluoroethylene fibers as sorbent. J Am Soc Mass Spectrometry. 2006;17(9):1258-64. Gupta C K, N Krishnamurthy, 2005. Extractive metallurgy of rare earths. 1st ed. CRC Press, New York, NY, USA, p: 22. Buchalová M, Komorova L, Galova M, et al. Separation of rare earth elements. I. Extraction of Sm, Pr, Nd with tributyl phosphate from nitrate solutions, Chem Pap. 1990;44(4):557-65. Simpson N. Solid-phase extraction: Principles, techniques and applications. Varian Associates. Inc., Harbor City, California, USA. 2000. p: 315. De Vasconcellos ME, Queiroz CA, Abrão A. Sequential separation of the yttrium—heavy rare earths by fractional hydroxide precipitation. J Alloys and Compounds. 2004;374(1):405-7. Gupta CK, Krishnamurthy N. Extractive metallurgy of rare earths. Int Mater Rev. 1992;37(1):197-248. Ramachandran VS, Paroli RM, Beaudoin JJ, et al. Handbook of thermal analysis of construction materials. William Andrew, Noyes Publications, New York, USA. 2002. p: 524. Preston JS, Cole PM, Craig WM, et al. The recovery of rare earth oxides from a phosphoric acid by-product. Part 1: Leaching of rare earth values and recovery of a mixed rare earth oxide by solvent extraction. Hydrometallurgy. 1996;41(1):1-9.